Qualification: PhD in Physical Therapy/speech-language pathology/Health Physical Education & Sports Science from HEC recognized University. 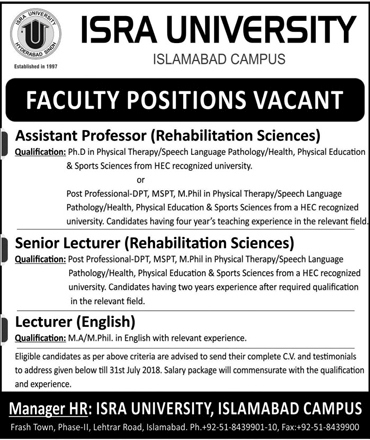 Qualification: Post Professional DPT, MSPT, M.Phil, Physical Therapy/Speech-Language Pathology Health Physical Education & Sports Science from HEC recognized University. Candidate having 02 years experience after required qualification in the relevant field. Qualification: M.A/M.Phil in English with relevant field.